For the first time since 2010, the number of homeless people in the US increased this year, according to new estimates from the Department of Housing and Urban Development (HUD). The main driver of this increase? Lack of affordable housing in metropolitan areas, especially those on the West Coast that have become synonymous with the booming tech industry. As a whole, homelessness has declined 13 percent across the nation since 2010, and most states have followed this trend since last year’s HUD Continuum of Care data was released. HUD says this year’s increase is being largely driven by cities in California, Oregon, and Washington, where soaring rent costs and stagnant wages have left the poor with few options for shelter. The booming economy, fueled by the tech sector, and decades of under-building have led to an historic shortage of affordable housing. It has upended the stereotypical view of people out on the streets as unemployed: They are retail clerks, plumbers, janitors—even teachers—who go to work, sleep where they can and buy gym memberships for a place to shower. 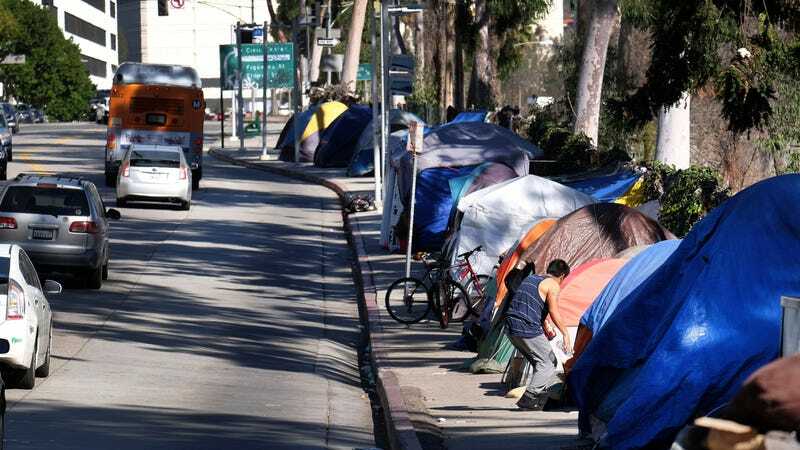 With housing costs rapidly rising, tent cities have cropped up in cities like Portland and Los Angeles (where homelessness spiked over 25 percent since last year), leading to public health crises. California declared a state of emergency earlier this year after multiple cities suffered an outbreak of hepatitis A. San Diego now cleans its sidewalks with bleach to combat another epidemic, the AP reports. City governments and non-profits alike are overwhelmed by the tide of long-term homelessness—a figure that grew 12.2 percent since last year. And the wealthy companies that have driven up living costs in these cities have not been quick to offer solutions of their own. When city infrastructure is pushed to its limit, that’s precisely what the federal government is supposed to do—reallocate funds to meet a growing need. Unfortunately for the nearly 554,000 homeless people counted by HUD this year, that seems unlikely to happen.